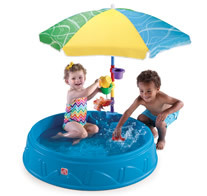 Really any kind should do the trick, but I especially like the Step 2 Play & Shade Pool ($59.99) because it is sturdy and should last at least this season, if not a few more. This pool is recommended for ages two and over, but it is perfect for my son right now, and he won't be two until August. The Step2 pool is made of a solid plastic, which is great because you don't have to inflate it and also because it should be more durable then the plastic ones which seem to tear or leak way too soon. The Step2 pool is also nice because it has an umbrella for shade and a bunch of toys to occupy the little ones, too. over the sprinklers marketed by the toy companies. 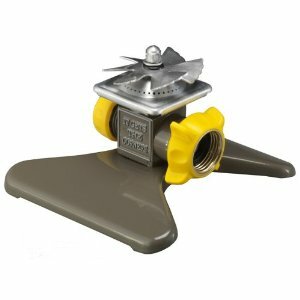 Not only are "real" sprinklers well-made and durable, but they are much less expensive then the sprinklers geared towards kids. We had the Little Tikes Super Spiral Sprinkler last summer, which was fun, but didn't make it past July before cracking, and it cost $30. Our Nelson sprinkler is on it's second season, and I can't imagine even my kids will be able to figure out how to break it. If like me, some days you're just not up to the pre-prep and post-production that accompanies toddler water-time, you need something fun (and dry!) to do in the backyard. My kid is endlessly busy with just a slide, or a slide with a minor climbing component. Step2 has The Play Up Toddler Climb & Slide ($79.99, ages 1-4) which is just big enough, without being too big for the toddler-sized. And, on a days when you're feeling particularly ambitious, the slide can even be positioned in the sprinkler or to land your kid in the kiddie pool. But of course, this is not officially recommended and would need some responsible adult supervision. While none of these ideas are exactly cutting-edge, they do keep the kid happy. And I would love to hear your ideas for toddler fun, too. What are your favorite things to do with toddlers in the summer? Should I get a sandbox? Or a see saw? I received a Step2 (Step Two) Play and Shade Pool for review. All opinions are my own. My son doesn't know which items were received for review, which ones we bought, and to be honest, which ones actually belong to the neighbors. you are bringing me back to my suburban childhood. well, except that my kiddie cool was certainly not as cool as the one you pictures. it was inflatable and my dad had to blow it up with himself because he was way too cheap to buy a pump. ah, those were the days. then, we got shipped off to six flags. Great ideas- tried and true! The family I care for actually has the Step 2 Play Up Toddler Climb and Slide. They purchased it at my suggestion after I conducted some pretty intense research. J. was a little over a year old when we got it, and he's now 28 months, and he still enjoys it. We've used it both indoors and out; it was a lifesaver during rainy weeks. Other good ideas for toddlers (and beyond!) Little Tykes has a plastic turtle shaped sandbox that is great, and both children(big sister is 5 years old) have spent hours enjoying it. Likewise, the Little Tykes free standing basketball hoop has provided hours of fun. Push, pull, and ride on toys are good too, if you have a place for your children to ride. I recommend the Mopi, sturdy, stable,kid powered, and fast-if the child wants it to be! @Lisa thanks for all the ideas - i haven't heard of the mopi, going to check that out now!